Amazon says it will take on 2,500 new permanent staff in the UK this year, bringing its total number of UK employees to 14,000. The online retailer will also create thousands more jobs elsewhere in Europe. It is investing to expand its European operations, including its warehouses, known as fulfilment centres. The company currently employs 40,000 people in Europe and last year created 10,000 jobs. It says it has invested more than €15bn (£11.5bn) on European infrastructure and operations since 2010, with £4.6bn in the UK. 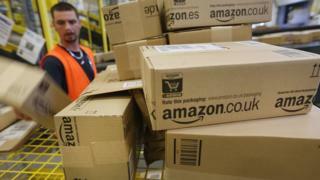 Amazon said the jobs would be added across its business operations in the UK. These include posts at its new London head office, which is under construction, and at three research and development centres, in Cambridge, Edinburgh and London, as well as at a customer service centre in Edinburgh. It will also be hiring people for its 10 warehouses and its new fashion photography studio in London. The new Amazon Web Services data centres, due to launch next year, will also need new staff as will local delivery centres. "Britain has a world-class tech sector with a reputation for innovation and excellence," said Amazon UK's managing director, Christopher North. "These new jobs we are creating up and down the country are testament to the quality of the workforce in the UK and our confidence in its economy, which we are proud to support through our continued investments," he said. Amazon first arrived in the UK in 1998, buying a local online book retailer to get into the market. Since then it has marched remorselessly into all kinds of retailing and other services, and this latest announcement signals that its desire for growth has not been sated. Many of the jobs will be in the vast warehouses which sort and dispatch goods, but the firm is keen to stress that there are also highly skilled research and development posts. In the Cambridge R&D centre, work will expand on projects like the voice recognition behind the Echo speaker - perhaps soon to arrive in the UK. London will be the focus for Amazon's Prime Video service and its battle with Netflix. But today's statement does not reveal anything about the subject which strikes fear into the boardrooms of the big supermarkets - any ambition to enter the fresh food retailing business. Amazon Fresh, launched in Seattle eight years ago, has made only slow progress in the US. But the company which has proved so single-minded, not to say ruthless, in pursuit of the efficient distribution of just about everything may see disrupting Britain's grocery trade as a challenge it just cannot resist. Since Amazon launched Amazon Fresh, its full online grocery delivery business in the US in 2007, there has been a lot of speculation about when a similar service might be introduced in the UK. The company refused to comment on its future plans for bringing Fresh to the UK. Last year it launched the more limited Amazon Pantry for dry goods and the Amazon Prime Now mobile app, which offers one-hour delivery on a range of about 200 grocery items. Those businesses will be taking on new staff as they expand. In its statement announcing the new jobs Amazon said it was looking for people with all types of experience, education and skill levels. It also highlighted its adult education programme, Career Choice which it said helps employees gain skills which they can use both working for Amazon and elsewhere. However, Elly Baker from the GMB Union said she can't give the new Amazon jobs "unqualified support". The union has concerns about the working conditions for workers at Amazon's warehouse. She told BBC Radio 5live, "What we hear from our members working in Amazon warehouses is these aren't good jobs. "The risk of losing your job and being replaced is ever present and for that reason we're nervous of giving it unqualified support when we know that in fact a lot of these jobs will be ones people won't be happy in. Effectively you're just a cog in a machine".